"This matching front-loading set will give you an advanced cleaning system." "The stackable design operates with minimal noise according to customers." "Both the washer and dryer have settings built-in to improve efficiency." "Using the LG laundry app you can receive alerts when a cycle is done." "One of the largest pairs of washers and dryers on the market." "For just under $500 a piece they will still get your clothes clean." "Altogether the until measures 74.5 x 23.75 x 43 inches." For a washer and dryer pair that offers top value overall, look to this advanced set from Samsung. This matching front-loading set will look great in your laundry room, but will also give you an advanced cleaning system to keep your clothes looking and smelling great. Both machines are equipped with steam technology, allowing you to sanitize and refresh clothing with the touch of a button. One important thing to know about Samsung’s Steam Wash technology is that it releases steam from the bottom of the drum — ensuring that it reaches every article of clothing as the drum rotates clothes. There are 10 cycles available on both the 4.5 cubic foot washer and the 7.5 cubic foot dryer, making this pair capable of tackling any laundry challenge you have in mind. Almost everyone agrees that this washer and dryer set is very quiet and does a superior job of cleaning even tough stains. Buy this quality set from Samsung for the features and enjoy it for the quiet operation and efficient cleaning capabilities. If you want to stay in sync on laundry day, a smart washer and dryer is a huge help. For the smartest top-loading washer and dryer, our pick is the new GE 5.0 cubic foot Smart High-Efficiency Top Load Washer and matching 7.4 cubic foot dryer (also available in gas). The large capacity washer has an impeller, to accommodate even bulky loads – like comforters or large loads of towels. The cavernous dryer has plenty of room to tumble laundry and features 14 cycles with five heat settings. This new introduction to GE’s product line takes the advances that the appliance company has made with smart home products and incorporates an automatic WiFi connection. Several other models of smart washers and dryers (including the smaller 4.5 cu. ft. GE Smart Washer) require an additional component to be purchased and installed for the machine to be capable of WiFi functions. This recent arrival to the GE lineup eliminates the separate purchase and hassle of installing additional components since the washer and dryer are smart home compatible straight off the delivery truck. Use the GE laundry app to track the progress of wash or dry cycles, add additional drying time, or download additional laundry cycles for special care items. Additionally, the machine features auto-dispensers for detergent and fabric softener—and it’s capable of re-ordering through Amazon when supplies run low (if the feature is enabled). Both units can also respond to voice commands, thanks to an Amazon Alexa and Google Home integration. Maybe one of the most useful reasons to splurge on a smart washer and dryer is the ability to receive a reminder when a load is finished but the door hasn’t been opened yet. No more forgotten towels or work clothes! Want to take a look at some other options? See our guide to the best smart washers and dryers. Bosch is a leading name in German appliance engineering and is known for their quiet, well-made home appliances. This smart looking washer and dryer set is no exception. With a stackable design, these units will maximize your floor space while still providing a high-quality laundry experience. The washer has 15 cycle options (the most of any pair on this list) and an EcoSilence motor which minimizes noise during operation. In fact, some users report not even needing to close the laundry room door thanks to the unit’s quiet motor. This can be a big advantage if you’re sensitive to background noises or simply don’t like to be bothered with the hum of a washer and dryer. The dryer also has 15 cycles to match your laundry needs and has moisture-sensing technology to control the drying cycle. You will sacrifice a bit of load capacity with this set, however. The washer has 2.2 cubic feet of space, and the dryer has 4.0 cubic feet of space. This is considerably less than some of the non-stacking pairs on our list. Still, the wide variety of available cycles and incredibly quiet operation makes this high-end stacking unit one of the best washer and dryer pairs that you can buy today. 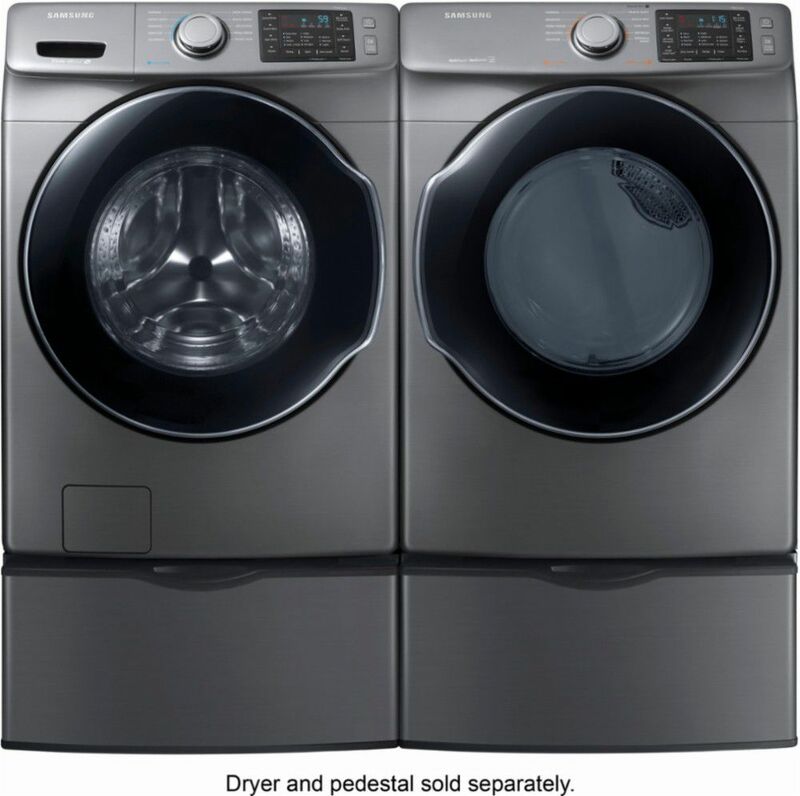 For a reliable washer and dryer that's energy efficient, this set from Whirlpool is a great choice. Designed with maximum savings in mind, both the washer and dryer have built-in settings that save you time and money. On the washer, you can take advantage of load sensing technology to avoid wasting unnecessary water on smaller loads. Though the drum is only 3.5 cubic feet, many users report that it holds a surprising amount of laundry. Moving over to the dryer, select the AccuDry setting to automatically stop the cycle when clothes are dry and ready for folding. And if you don’t get to the laundry room right away, an optional Wrinkle Shield setting will periodically tumble the clothes to prevent pesky wrinkles from becoming a problem. Each of these features translates into savings on water, energy, and time. If you are looking for a smart washer and dryer set that offers the aesthetics and functionality of front-loading machines, LG’s 5.2 cubic foot Washer with Steam and Wi-Fi Connectivity paired with the matching 9.0 cubic foot dryer won’t disappoint. LG has been developing its SmartThinQ technology for several years, and these machines combine smart appliance features with an advanced laundry care system. The washer and dryer both feature 14 cycles to match any garment care needs that you may have. Additionally, the washer is part of LG’s TwinWash system – meaning you can add an additional pedestal washer for additional washing capacity and flexibility. Using the LG laundry app, you can see remaining cycle times and receives alerts when a cycle is done or if a problem pops up. One neat capability is that you can start the washer or dryer from anywhere using your smartphone. Additionally, these appliances are Smart Grid-ready, meaning that they can choose operating times when energy costs are lowest. Are you looking for a large capacity washer and dryer that will conquer your laundry baskets once and for all and impress your friends with its mammoth size? 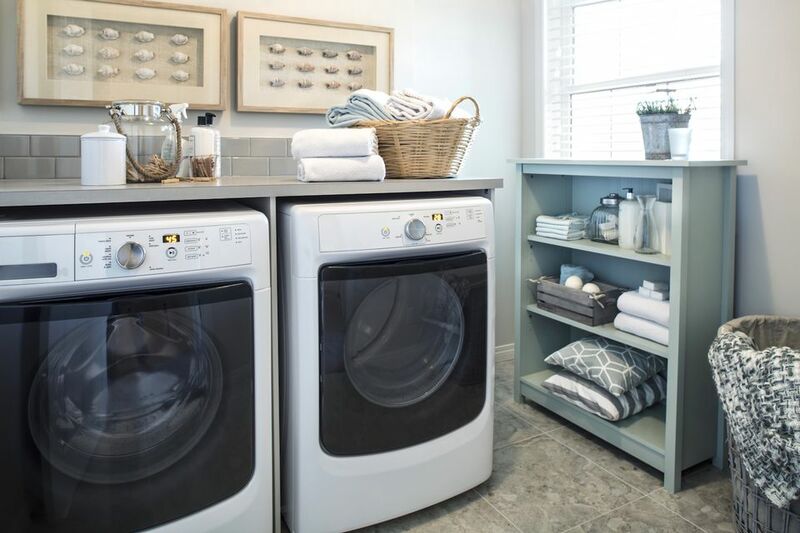 The Kenmore 5.2 cubic foot Front Load Washer and 9.0 cubic foot Front-Loading Dryer are among the largest pairs of washers and dryers on the market today. The spacious 5.2 cubic foot drum of this front-loading washer features a tumble action agitator and a stainless-steel wash basket for years of rust-free and chip-free use. The machine features nine wash cycles and an internal heater that assists detergent in removing tough stains. Steam treat and accelerated wash options let you breeze through large loads of laundry in no time. It delivers thorough cleaning power with all the bells and whistles on a modern washing machine. Once you’ve washed a super large load, you’ll need a super-sized dryer to finish the job. The matching 9.0 cubic foot dryer is up for the task. Equipped with six cycles, the dryer has the right settings for any type of load. The machine also has a steam cycle to loosen wrinkles. Together, this Kenmore pair is tough to beat in terms of capacity and keeps up with the competition in terms of features and benefits. If large laundry loads are a frequent occurrence in your household, this is the set for you. For a washer and dryer set that works well, but won’t break the bank, there’s this duo by Amana. For just under $500 a piece, they don’t provide all the bells and whistles of some of the pricier models, but they will get your clothes clean. The top loading washing machine has nine cycles and four water level choices, so you can match the water usage to the size of your load. It has a 3.6 cubic feet capacity. Customers say it’s a great washer for the price and has exceeded their expectations. The 6.5 cubic feet dryer has 11 cycles to choose from, as well as an automatic dry sensor, which stops a cycle when your clothes are dry, so no energy is wasted. The door is reversible, so you can choose which direction it will swing to best accommodate your space. Customers say it’s quick, quiet and gets the job done. If space is tight, this washer and dryer pair may be just the right fit. The single unit is equipped with a 2 cubic foot washer below and a 4.4 cubic foot electric dryer on top. Altogether, the until measures 74.5 x 23.75 x 43 inches. The washer has 12 wash cycles and six rinse temperatures to choose from, as well as auto-load sensing that will automatically adjust the right amount of water to each load. The dryer has four cycles and will automatically turn off when it senses that clothes are dry. It offers a dewrinkle option as well as a quick fluff option to freshen up fabrics. Customers say it works well and is a great space saver, though some complain that it’s noisy. We bought and tested two top-rated washer and dryer sets. Our reviewers spent 40 hours running cycles, trying out the different settings, and observing their overall performance. We asked our testers to consider the most important features when using these sets, from their capacity to their energy efficiency. We’ve outlined the key takeaways here so that you, too, know what to look for when shopping. Design One of the most important decisions to make when buying a washer and dryer set is its design. First, you’ll need to choose between top- or front-load washer. Front-loading machines are typically more expensive but faster and gentler on clothes. Depending on where you’re putting the set, you may also want to look for stackable appliances, which will take up less space but require a special installation kit. Capacity Different washer and dryer sets have different capacities. Some washers have a capacity of only 2 cubic feet, while high-end models can hold up to 5 cubic feet or more. If you have a one- or two-person household, a smaller set may work just fine, but those with larger families might want to consider machines that can hold multiple loads of laundry at once. Energy efficiency Many modern washer and dryer sets are Energy Star-certified, but some budget options don’t include this feature. (Energy Star-certified appliances are designed to be more efficient to help you save electricity and water.) However, the downside of these appliances is that many of them require special high-efficiency detergent to run optimally. This washer and dryer set earned high marks from our testers across the board. “The set is extremely attractive, quiet, and works very well,” one reviewer raved. “It has a large capacity, is water efficient, and has eco-dry options that use less electricity.” One of our testers also reported that the washer “cleaned all loads of laundry very well” and the dryer “worked perfectly on all the different settings.” In terms of negatives, one tester expressed concern that the top of the washing machine doesn't seem very durable. “I was keeping my bottle of detergent on top and it created a deep scratch,” she said.” One reviewer also reported getting socks and small clumps of hair stuck in the rubber door closure on the washing machine. In addition to this set being “extremely efficient in limiting water and detergent use,” our reviewers were fans of its convenient WiFi feature and accompanying GE app that alerts you when a load is finished. “The steam de-wrinkle and steam refresh options on the dryer are great for fluffing up and de-wrinkling clothes right before you head out of the door,” one of our testers noted. One thing to be aware of is its size: Because the washer is tall and the basin quite deep, according to one of our reviewers, it can be difficult to pull the clothes out at the end of the cycle.